The train couplers had me thinking for a long while. I considered making them from metal but in the end decided high density urethane made more sense. Using this modern material I could easily make them slightly oversize in a fashion that suited the train. Here's the pieces dry fit to make sure it all looked good and in scale with the train. We first welded up some sturdy steel tubing to laminate the cut HDU pieces over. This heavy framework will be welded to the train engine and log car frames to hold the hitches in place. 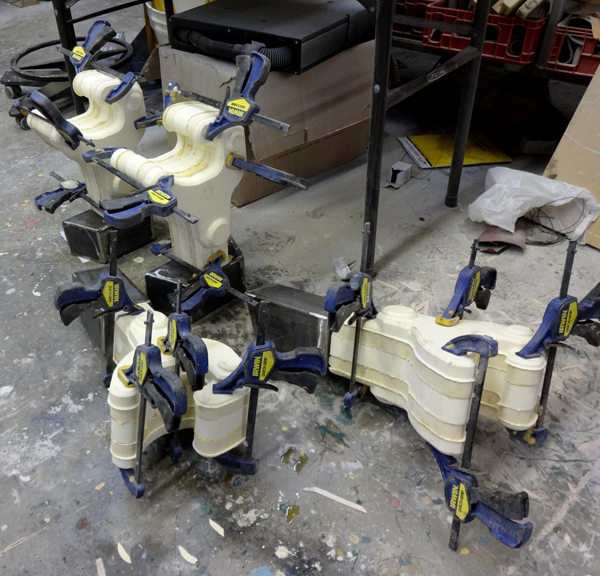 Late this afternoon I glued and clamped the many pieces together. Tomorrow we'll clean up the assembled couplings and permanently weld them into place, making them ready for the rusty paint.